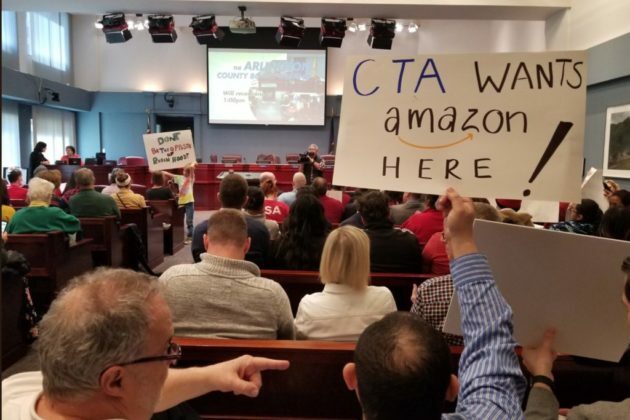 (Updated on 3/18/19) Arlington officials have unanimously approved an incentive package offered to lure Amazon to the county, after hearing impassioned public testimony both for and against the tech giant’s “HQ2” plans. The vote clears the way for the company to officially begin developing the site as early as this year. 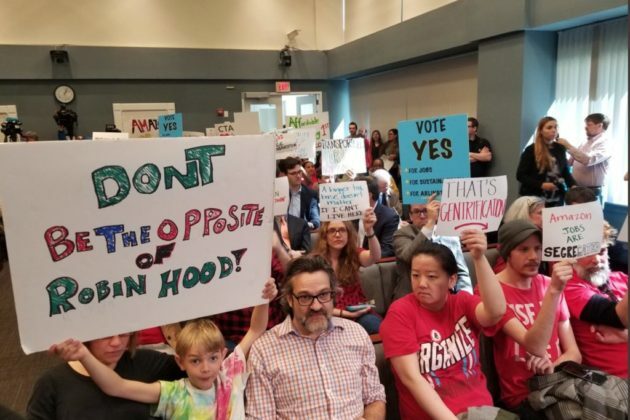 The Arlington County Board voted 5-0 to approve the incentive plan after Board’s regularly-scheduled Saturday meeting stretched on for nearly twelve hours and disruptions from angry protestors continued until Chair Christian Dorsey called multiple recesses to quell the shouting. Board member Libby Garvey acknowledged over booing that the incentive plan was “not perfect” but said it was “overwhelmingly” good for Arlington. After Amazon representatives were ushered into a back room during an earlier outburst, Board members sat back on the dais and spoke for a few minutes about the tensions in the room, which was quiet for the first time that day. Protests continued after the back-and-forth, with shouts of “shame!” peppering the Board members’ final remarks on the dais. Longtime D.C. protestor Chris Otten was escorted out and arrested after an expletive-ridden tirade aimed at the Board. The incentive package grants an estimated $23 million in incentives to Amazon over the next 15 years if the company fills 6 million square feet of office space by 2035. It also includes a plan to fund $28 million in transportation upgrades near Amazon’s headquarters over the next decade via use of Crystal City’s Tax Increment Financing district. The Board’s vote came after nearly five hours of public comment from more than 100 people. County staff said it was first time they’ve allowed speakers to sign-up ahead of time in a bid to control crowding. The Board also questioned Amazon’s head of economic development Holly Sullivan. Board members Katie Cristol and Dorsey both asked how Amazon planned to enforce labor laws in light of the subcontractor electrical Power Design, which is likely to help build the headquarters and is currently being sued by the D.C. Attorney General for “cheating” wages from 535 employees. One of Arlington’s state legislators, Del. Mark Levine, told ARLnow he wanted the Board to delay their vote because he’s “become concerned” that Amazon still hasn’t agreed to that labor commitment. “The fact that they’re not willing to sign even a memorandum… makes me concerned that they’re not going to be fair to their workers,” said Levine, echoing concerns from electrician and construction unions that testified earlier today. Amazon also drew criticism for potentially shrinking affordable housing in the region which is already squeezed. Several landlords and real estate firms expressed support of the company locating to Pentagon City and Crystal City, but other speakers shared worries that rent prices are already rising. “When we have community that isn’t transient, that has staying power, we have a stronger community.” said Page Cooper, who said her 13-month lease shrunk to 8 months when it came time to renew last year. Supporters said the economic growth from Amazon’s promise of 25,000 is sorely needed. It’s also a number Dorsey has said could increase in light of Amazon cancelling its plans for a second headquarters in New York City. The county “needs these jobs” and that is “well positioned to integrate Amazon,” due to the area’s public transit system, said Chuck, Executive Director of the Metropolitan Washington Council of Governments. Steve Cooper, a board member at the Arlington Chamber of Commerce, compared Arlington — long a community with government as its top employers — to his hometown in Detroit. The crowd was roughly equally split between those for and against the incentive package — and Board Chair Christian Dorsey repeatedly tried to quell laughter and applause, with emotions running high as the day wore on. Douglas Park resident Kinsey Fabrizio was praising the board for its “public outreach” when loud laughter from activists, who criticized what they described as lack of community input, drowned out the rest of her testimony. “This is not WWE,” Dorsey said as he quieted the crowd. 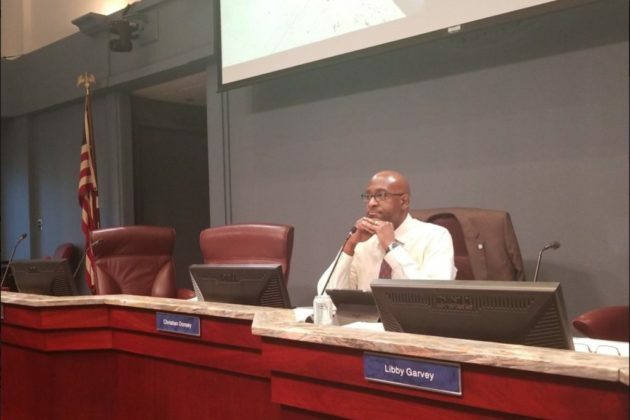 The Crystal City Civic Association and the Crystal City Citizen Review Council voiced support for the tech giant building its second home in their neighborhood. The Aurora Highlands Civic Association and the local chapter of the NAACP, however, said more community engagement is needed before they can support the deal. 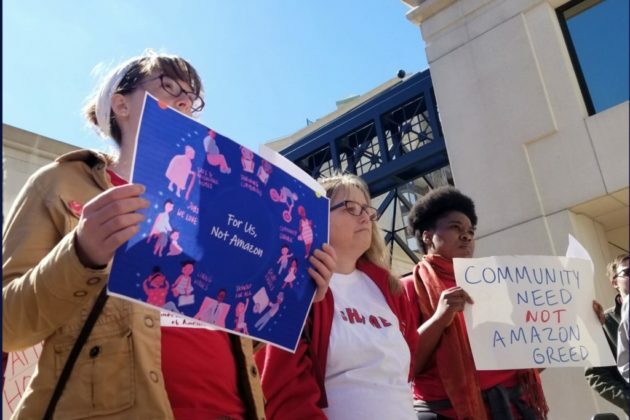 The raucous meeting began with a protest outside the steps of the government building with pro- and anti-incentive groups giving simultaneous press conferences holding picket signs. Local activist coalition For Us, Not Amazon discussed concerns that Amazon had provided ICE with facial recognition software for deportations. 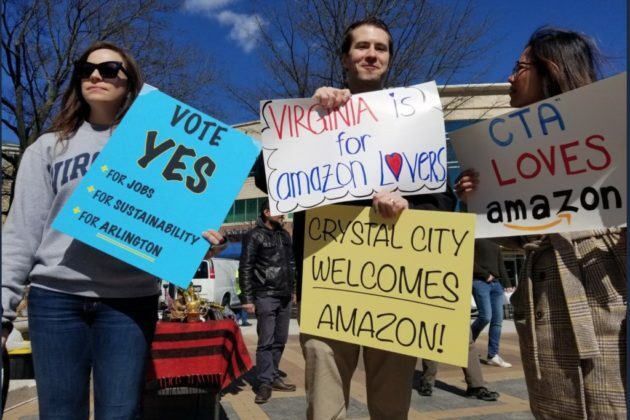 Crystal City BID President Tracey Gabriel was firmly in the pro-Amazon camp, telling ARLnow, “we view Amazon’s selection as a big local win” that will provide “sustainable development” for the area. The president of the Arlington Chamber of Commerce, Kate Bates, also testified in support of the plan, echoing her recent op-ed that the incentives were “a good deal” for the county. Today’s meeting comes almost two months after the Virginia General Assembly overwhelmingly approved their own incentive package for Amazon. The state-level incentives include up to $750 million in tax cuts in exchange for Amazon creating as many as 37,850 Virginian jobs between now and 2030. State legislators have also pledged millions in state funding for Arlington and Alexandria’s local infrastructure projects around Amazon’s proposed headquarters — such as adding new entrances to Crystal City and Potomac Yard Metro stations and improving the stretch of Route 1 that runs through Crystal City. Amazon’s Holly Sullivan noted during Saturday’s meeting that the company picked the area partially because it could be served by three Metro stations. Christina Winn, of Arlington Economic Development, said Amazon could bring a $162 million net tax benefit for Arlington. Winn added that the county’s haul could rise to $319 million if the company creates more than 25,000 jobs. Prior to public testimony, County Manager Mark Schwartz defended the package. “I would never have recommend this agreement to you if I thought for one minute that this would harm the community I call home,” Schwartz said. Just don’t expect Amazon’s tens of thousands of employees to arrive all at once. Winn noted that Amazon’s arrival would be “slow ramp-up” with around 400 employees expected in 2019. “Even though this hearing has a sense of finality this is far from our last Amazon conversation,” said Dorsey. Additional hearings are expected down the road as Amazon moves to build out its office campus in Pentagon City. For the time being, the company is expected to occupy temporary office space in Crystal City.